This book has a little history to it that I have to explain. I was offered a chance to review this book back in April of this year but I declined because my brother-in-law had just died and my dad was at the end stages of his battling cancer. I knew I wasn't going to be able to read it in a timely fashion. However, I have a little bit of a relationship with the person offering the book and she suggested that I might want to MAKE time to read this book as it could be very helpful for where I was at, personally, at the time. I didn't think it was fair to accept the book with my limited time so I declined and the lovely lady sent it anyway. I smiled to myself, very much appreciated the gesture of faith (dual meaning there) and purposed to read it. When the going gets tough, I start to wane in the prayer department thinking to myself that I just. need. to. make. it. through. to. the. other. side. After I'm through with the trial, then I'll get back to praying. It's sort of an anesthetic response. Keep walking, quit feeling, quit thinking, just do what needs doing and get by until the dust settles. After the dust settles, I anticipate being able to think more clearly and THEN I will pray about everything I learned. Yes, after a point, that's the position I land on. And it is a biblical incorrect position. 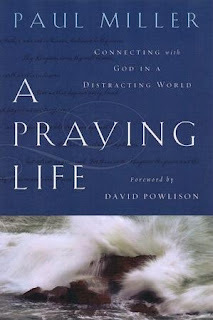 In this book, A Praying Life , author Paul Miller offers a great deal of practical advice on prayer. It is not a treatise on Biblical Prayer, although it is that. It isn't a "This is the best time of day, best place to stand, words to use" sort of book. Not at all. It is a great deal of his personal approach to prayer along with personally witnessed outcome of prayer. For all intents and purposes, Miller is a man who sounds like he's well practiced and anyone who is well practiced is someone that I ought to be listening to. 1. It is ok to pray "child-like" prayers. In fact, it is encouraged! One of the reasons I have resorted to "praying nothing" is because I feel too numb to pray. My brain can't come up with words that sound "good" and pride rears its ugly head. Sometimes all I can think of saying is, "Help. Help. Help." I feel guilty about that but Miller would say that when we approach God that way we are being totally humbled (a good thing in my case!). He will not reject us or refuse to hear our humble, pitiful and simple cries for help. Rather, He will hear us as little children and meet with us at our low points and work in us to His glory. I think I needed to hear that. Not that I want another trial with which to be tested on this point but I am telling myself that I need not feel guilty when all I can think of saying is, "God, help me." Because it is truth to say that I cannot help myself. 2. Prayer and scripture go together. It is not one or the other. It is both. We pray in faith, believing all things. We read scriptures to find out who God is and how He works. If we pray according to who He is than our prayers will be more effective. Say I wanted to be a millionaire (for the record, I do not). "God, make me a millionaire." I'm prayin' in faith believing that I'm going to check my bank account in the morning and it's gonna be there. I have the prayer. I have the belief. Now. What does scripture say? Well, scriptures would seem to indicate that those who will not work will not eat by which I could deduce that if I'm unwilling to work for money the chances of it just falling into my lap without effort are on the slim side of things. Secondly, scriptures talk about working for profit wisely, managing money wisely and distributing it wisely. Money is not a bad thing but it is not perfection. Money can make it harder to believe and being mesmerized by the bank account might not be in my best interest. Sooo... I could pray the prayer but I must examine the request in light of scripture. Does God drop money? Well, yes. He makes provision for his children and sometimes that involves money. I could get into a complex argument here but I'm trying to keep it simple. Simply stated: I don't think praying for a million bucks to land in my bank account in a miraculous/magical way is a very biblical request. What Miller tries to get the reader to understand in this book is that we need to live by faith and according to scripture. We should not be swinging by extremes in either direction, limiting God's ability to continue to work in this here "modern age" nor should we be emotionalistic/romantic thinking God will do whatever we want Him to do. Miller calls for balance. Lastly, one practical suggestion Miller offered was to create "prayer cards" on which to write down your specific requests. He suggests labeling index cards at the top with a person's requests or needs and then filling the card with specific things to focus your prayer time on. He shared the cards that he created for his kids and wife in this book which I found very helpful and I'm kinda leaning towards trying that approach myself. A Praying Life was practical and good. Published by NavPress and endorsed by J.I. Packer I feel pretty comfortable adding a pitiful recommendation of my own. The person who suggested I should have read it earlier? Well, she was right. This sounds very good, Carrie. I'm sort of like you (and I suspect my people are)--I pray the least when I should pray the most. I like the "okay" to pray child-like prayers. I might have to find a copy of this one! I'm reading this right now! It doesn't seem to be the typical book on prayer. Not that others aren't good, but this is just all around good and practical. I'm only a few chapters into it. I think every Christian should read this! Wow, ok, its going on my Amazon wish list for sure. I passed on this one as well when given the opportunity and now I wish I hadn't! Thanks for sharing so honestly. I just finished this one a couple weeks ago and felt much as you did -- good, practical stuff that I needed to hear. I've started some prayer cards for my family and am really liking this approach. Even more, I loved his emphasis on our needing to realize how helpless we are, and how much we need him (all the time! ).